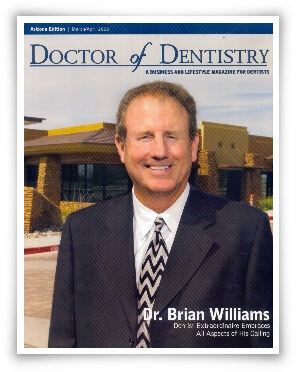 Dr. Williams – Dr. Brian Williams, D.D.S., F.A.G.D. 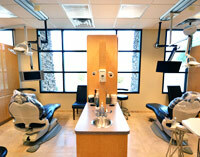 Dr. Brian H. Williams has been practicing dentistry in the Valley for more than 30 years. He is an award-winning, international presenter and is currently a guest lecturer at UCLA’s School of Dentistry in the Division of Advanced Prosthodontics, Biomaterials, and Hospital Dentistry, as well as the Past Clinical Director of Advanced Dental Education at the Arizona School of Dentistry and Oral Health in the Advanced Education in General Dentistry Residency Program. A 1975 graduate of the University of the Pacific, he completed post graduate hospital residency at the San Francisco VA Hospital and post graduate studies in UCLA Maxillofacial Prosthodontics Programs. Dr. Williams is currently on staff at Mayo Clinic Hospital and Banner Desert Hospital, where he uses his advanced skills in advanced hospital dentistry, as well as Maxillofacial Rehabilitation. Dr. Williams is committed full time to his private practice in Scottsdale, Arizona, where he focuses on family and preventive dentistry, as well as lending his advanced skills in cosmetic and reconstructive dentistry. He presents cutting-edge research on intra- and extra-oral implants as they relate to quality of life. His work in maxillofacial prosthodontics is internationally recognized. Dr. Brian Williams grew up in Scottsdale, Arizona and attended the US Naval Academy and Arizona State University undergraduate programs. He is also a Master Scuba Diver Instructor and spends his spare time with his wife Dawn playing tennis, golf and enjoying underwater photography. To read Doctor of Dentistry Magazine’s feature article on Dr. Williams, click here. Ashley graduated from Rio Salado College in 2009 with an Applied Science degree. 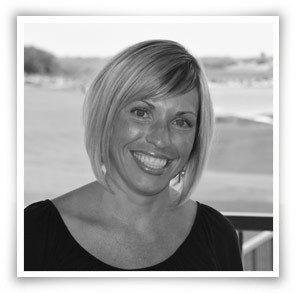 She has been working with Dr. Williams since 2010 as a Dental Hygienist. Prior to her entry into hygiene, she worked as a dental assistant for 6 years. Ashley’s love of dental hygiene fuels her desire to provide an important service to our patients. She enjoys the opportunity to help our patients understand why complete oral care is so beneficial to their overall health. “Patients always come first in this office.” In her spare time, Ashley is into health and fitness. Also enjoys boating, camping, vacationing and most of all spending time with her family. She and her husband have two son’s Kash and Krew. Kristine our Dental Assistant has been working in various aspects of Dentistry for 15 years getting her Certified Dental Assistant certification from Phoenix College. 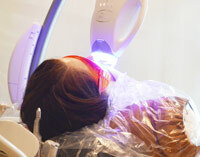 “I always enjoyed going to the dentist as a kid and now I love passing on good experiences to my patients and making sure they are comfortable and feel like they are in a safe place.” She has been fortunate to work in Pedodontics, Orthodontics, dental front office, as well as cosmetic dentistry. Kristine was born in California but was raised in Arizona and calls the desert her home. In her free time Kristine can mostly be found singing and playing her conga’s in one of her bands. Kristine’s favorite thing to do in dentistry is to whiten peoples teeth so come on in and let her brighten your smile! 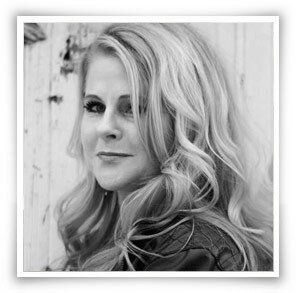 Stacy recently joined our practice after moving from Missouri to Arizona. She is truly enjoying being in such a warm and sunny climate. Stacy has been in the dental field for over 20 years. 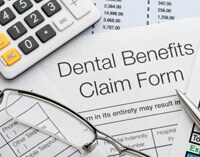 She has experience with both dental office management and dental assisting. Dentistry is a passion of Stacy’s. She loves being able to help people and see the positive affect dental treatment can make in a patient’s life. Outside of the dental office, Stacy enjoys spending time with her daughter, hiking, yoga and volunteering at animal rescues.